Stephen R. Burge is Research Associate at Institute of Ismaili Studies, London. He is the author of Angels in Islam : Jalal al-Din al-Suyuti’s al-Haba’ik fi akhbar al-mala’ik (Routledge, 2012). The basic intention of Qur’anic exegesis (tafsīr) is to understand what the text of the Qur’an means. Before attempting to understand anything of the Qur’anic worldview, its theology and ethical values, there is a need for exegetes to engage with the individual words found in the Qur’an itself. Yet, exegetes and translators, whether medieval or modern, have different theological perspectives, which influence how they do this. Many modern scholars have recognised that lexicology plays an important part in exegesis, but there are few studies of how exegetes use it to develop their interpretations of the Qur’an or that address lexicology in Qur’anic exegesis in any depth. This volume of essays addresses this gap in the scholarship. 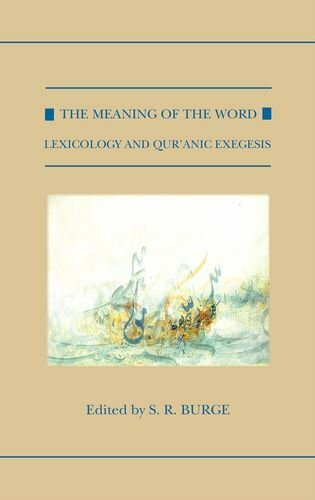 The Meaning of the Word provides an overview of the development of lexicological analysis in the tafsīr tradition, and examines how exegetes interpreted words in the Qur’an. The contributions reflect on lexicology in Qur’anic exegesis through studies of a wide range of subjects, from linguistics to literary criticism, and law and gender to mysticism ; examinations of the issue of lexicology in the Arab, Persian, Turkish, and European worlds ; and studies of the earliest discussions of Qur’anic lexica to those made in twentieth-century Turkey and recent English translations of the Qur’an. Herbert Berg is Professor in the Department of Philosophy and Religion at the University of North Carolina, Wilmington. S. R. Burge is a Research Associate at The Institute of Ismaili Studies, London. Ayesha S. Chaudhry is Assistant Professor of Islamic Studies and Gender Studies at the University of British Columbia. Agostino Cilardo is Professor of the History and Institutions of the Islamic World, and Professor of Islamic Law at the Università degli Studi di Napoli ’L’Orientale’. Claude Gilliot is Professor Emeritus of the Université d’Aix-Marseille and IREMAM, and a member of the Institut Dominicain d’Études Orientales (IDEO) in Cairo. Toby Mayer is a Research Associate in the Qur’anic Studies Unit at The Institute of Ismaili Studies, London. Christopher Melchert is University Lecturer in Arabic and Islam at the University of Oxford. Devin Stewart is Associate Professor of Arabic and Islamic Studies at Emory University. Kees Versteegh is Professor Emeritus of the University of Nijmegen. Stefan Wild is Professor Emeritus of the University of Bonn (Rheinische Freidrich-Wilhelms Universität Bonn). M. Brett Wilson is Assistant Professor of Islamic Studies at Macalester College. Travis Zadeh is Assistant Professor of Islamic Studies at Haverford College.